**The Advisor has contractually agreed to reduce its fees and/or pay Fund expenses until at least July 31, 2018. The early signs of global growth nourished gains in U.S. stocks, as well as markets around the world in 2017. Despite the long anticipated process of the Fed normalizing interest rates, North Korea lobbing missiles over Japan, and a host of natural disasters during the year, U.S. stocks, as measured by the S&P 500 Index, experienced an impressive gain of 21.8% in 2017. And if that was not enough, the S&P 500 Index for the first time in its history posted positive gains in every single month of the year. Such linear moves in equity markets without a normal 5% or more correction are unusual. We suspect the lack of volatility in 2017 resulted from ample liquidity in the system and a lack of other investing alternatives for most investors. Furthermore, we believe the overwhelming trend towards passive investing could have also been a contributor to the lack of normal volatility in equity markets in 2017. Gains in most major U.S. stock indices were led by growth stocks, which typically carry much higher relative valuations and hold an edge in a slower growth economy. However, we believe the relative edge of growth stocks, some of which have little to no earnings, could be reversed as economic conditions pick up and growth becomes less scarce compared to recent years. As a result, the investment team at Hodges Capital Management spent a good deal of 2017 positioning our portfolios to potentially benefit from broader economic growth and earnings improvement across a wide number of sectors. We believe an improved outlook for earnings in 2018 should be supported by a more business-friendly tax and regulatory environment. As the prospects for significant earnings improvement in 2018 appears likely for many U.S. companies, we see compelling investment opportunities in many of the cyclical areas of the market such as financials, consumer discretionary, technology, and industrials, which have the most earnings upside potential in the current environment. By contrast, we see less long-term opportunities in utilities, telecom, and consumer staples which had benefited the most from low interest rates and a flight to “safety” in recent years. Although the structural changes to the business landscape in the U.S. are difficult to ignore, we are not attempting to forecast or market time interest rates, currency fluctuations, or commodity prices. Instead, we believe 2018 will be an ideal time to scrutinize the fundamentals of individual companies. Although not true for every company, we see the potential for upward earnings revisions for many of the companies in our portfolios during the first half of the year as Wall Street analysts digest improved pricing power, lower taxes, and the benefits of greater consumption. Recent discussions with a number of corporate management teams also suggest that higher profits and the repatriation of overseas cash should bode well for new capital investment, as well as share buybacks and dividends in the year ahead. As always, we are making a conscious effort to remain objective and open-minded in our buy and sell decisions, while continuously looking for new opportunities around every corner. Furthermore, we believe that there are many high quality companies running great businesses with excellent management teams that are still trading at bargain prices. Despite the market’s rally in 2017, we still find U.S. equity valuations reasonable with the S&P 500 Index trading at 18.4X forward earnings estimates according to FactSet. The inverse of this multiple is an earnings yield around 5.43%, compared to the 10-year treasury yield of 2.41% at year end. We believe this risk premium indicates that the potential reward for holding stocks still outweighs the underlying downside risk potential. During 2017, the research team at Hodges Capital Management continued to rigorously gather and analyze firsthand information from a broad scope of publicly traded companies, which involved making more than 2,500 contacts across more than 1,000 management teams. Here are a few worthwhile observations. First, most management teams seem more confident regarding the prospects for demand growth, pricing power, potential margin improvement and earnings growth in the next year compared to a year ago. For some companies, we still think consensus earnings estimates are too low for 2018 and 2019 given recent tax reform. Second, balance sheets are generally in good shape, allowing many corporations to continue to reinvest in capital projects, make strategic acquisitions, buy back shares and historically pay dividends. Lastly, we do not see the typical signals (such as a buildup of inventories) that would be conducive to a coming recession in 2018. However, we do see some inflationary cost pressures in the supply channels for certain industries, which are consistent with the latter stages of an economic cycle. While we would be surprised to see the Price/Earnings multiple for the average U.S. stock expand meaningfully in 2018, we see further gains in the market being supported by earnings growth and stable multiples for most of the economically sensitive sectors of the market. While we are encouraged with the opportunities in the year ahead, we know 2018 will not be without its own unique challenges, and would not be surprised to see one or more normal market corrections at some point during the year. In the midst of increased volatility, we have historically found bargains as we are rigorously look for investments in well-run businesses that control their own destiny by relying on ingenuity and well-calculated business decisions. Although the macro conditions impacting the market can seem overwhelming at times, we always fall back to the idea that the long-term performance of stock prices is determined by the future earnings and cash flows of each underlying business. In conclusion, we see 2018 as an ideal environment for active portfolio managers to carefully select individual stocks that we believe can generate long-term value for shareholders. During the final quarter of 2017, the Hodges Small Cap Fund experienced a return of 10.81% versus 3.34% for the Russell 2000 Index. Positive relative performance in the most recent quarter reflected strength in many of the Fund’s cyclical, financial and material related stocks. However, the Fund lagged for the full calendar year end December 31, 2017, generating a return of 9.19% compared to 14.65% for the Russell 2000 Index. Disappointing relative performance during the entire calendar year was attributed to the Fund’s overweight exposure in many of the same cyclical related stocks that drove the fund positive performance in the recent quarter. While hindsight clearly suggest we were a bit early in our portfolio positioning this year, we remain concentrated in our highest convection stocks that we believe dive performance over the next twelve to eighteen months. The Hodges Small Cap Fund remains well diversified across industrials, transportation, financial services, technology, and consumer-related names, which we expect could contribute to the Fund's long-term performance. The Fund has recently taken profits in several stocks that appeared fairly valued relative to their underlying fundamentals, and established several new positions in stocks that we view as having an attractive risk/reward profile. The total number of stocks held in the Fund at the end of the year was 47 compared to 66 at the beginning of this year. Top ten holdings at the end of the quarter represented 38.47% of the Fund's holdings and included Texas Pacific Land Trust (TPL), Nutanix, Inc. (NTNX), Eagle Materials Inc. (EXP), Encore Wire (WIRE), Spirit Airlines (SAVE), Tower Semiconductor Ltd. (TSEM), Hilltop Holdings Inc. (HTH), Legacy Texas Financial Group (LTXB), United States Steel Corp. (X), and Air Transport Services Group (ATSG). The Hodges Fund's fourth quarter 2017 return was 11.80% compared to a gain of 6.64% for the S&P 500 Index. 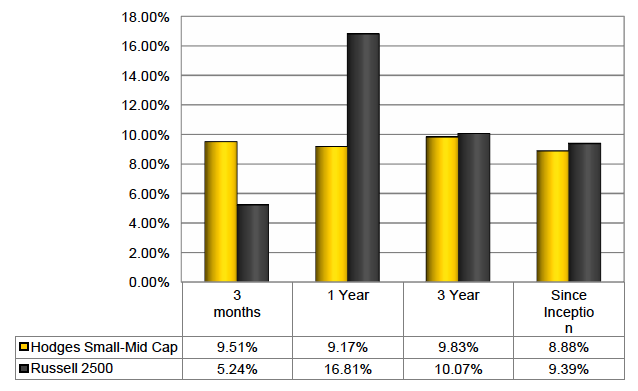 Positive relative performance in the recent quarter was attributed to individual stock selection. After beating the S&P 500 by 27.82% in 2016, the Fund finished the full year up 13.83% in 2017 compared to a gain of 21.83% for the S&P 500 index. The Hodges Fund remains focused on investments where we have the highest conviction. The number of positions held in the Fund at the end of the recent quarter was 41. During the final calendar quarter of 2017, we took profits in a few stocks that appeared to offer less additional upside potential relative to their downside risk, increased the size of several positions in which we remain convicted, and entered into several new positions. For example, the Hodges Fund exited its position in Amplify Snack Brands (BETR), after the Company entered into an agreement to be acquired by Hershey (HSY) for $12 per share. The Fund also entered into several new positions in the recent quarter such as home builder Century Communities (CCS), and pet food provider Blue Buffalo Pet Products (BUFF). Top ten holdings at the end of the quarter represented 36.80% of the Fund's holdings and included Texas Pacific Land Trust (TPL), Nutanix, Inc. (NTNX), Eagle Materials Inc. (EXP), Gogo Inc (GOGO), American Airlines Group (AAL), United States Steel Corporation (X), Ring Energy Inc. (REI), Matador Resources Company (MTDR), Micron Technology Inc. (MU), and Facebook Inc. (FB). The Hodges Blue Chip Equity Income Fund experienced a gain of 8.24% in the fourth quarter of 2017 compared to a gain of 6.59% for the Russell 1000 Index. For the year, the fund experienced a total return of 24.79% compared to a 21.69% return for the Russell 1000 Index. Positive performance relative to the benchmark in 2017 reflected strength among several of the Fund’s high quality industrial stocks, such as Boeing (BA), as well as several technology names like Facebook (FB) and Apple, Inc. (AAPL). Looking ahead, we seek to find plenty of attractive high quality dividend-paying stocks that offer upside potential in addition to dividend income as stable corporate profits support the ability of companies to pay out dividends. The Blue Chip Equity Income portfolio remains well diversified in companies that we believe can generate above average income and total returns on a risk adjusted basis. Top ten holdings at the end of the quarter represented 45.71% of the Fund's holdings and included The Home Depot, Inc. (HD), Microsoft Corporation (MSFT), Facebook (FB), Johnson & Johnson (JNJ), Citigroup Inc. (C), Union Pacific Corporation (UNP), Verizon Communications Inc. (VZ), Delta Air Lines Inc. (DAL), The Boeing Company (BA) and Apple Inc. (AAPL). The Hodges Blue Chip Equity Income Fund's assets as of December 31, 2017, were $23.7 million (MM) compared to $23.2MM at the beginning of the calendar year. The Fund experienced net inflows of $0.7MM in the recent quarter. Looking ahead, we believe the Blue Chip Equity Income Fund offers long-term investors an attractive total return in higher quality dividend paying stocks. After standing out as our best performing fund in 2016 (up 70.51% compared to a return of 11.96% for the S&P 500), the Hodges Pure Contrarian Fund was our worst performing fund in 2017. For the entire year ending December 31, 2017 the fund was down 2.82% compared to a gain of 21.83% for the S&P 500. However, the Fund experienced a gain of 7.09% in the recent quarter, which beat the 6.64% gain for the S&P 500 Index over the same period. The Fund’s significant underperformance over the past twelve months has been largely attributed to several turnaround situations that demonstrated limited progress. Although timing a recovery in contrarian stocks can be tricky over short periods of time, we believe this strategy could be rewarding over a long investment horizon. We also expect this strategy to be less correlated with the broader market due to the general nature of contrarian investing. During the recent quarter, we continued to position the Fund in out-of-favor investment opportunities that we believe offer the best upside potential relative to their downside potential. Top ten holdings included Comstock Resources (CRK), Mesabi Trust (MSB), American Eagle Outfitters (AEO), Ring Energy (REI), Gogo Inc. (GOGO), Signet Jewelers Limited (SIG), Cleveland-Cliffs Inc. (CLF), United Continental Holdings (UAL), Spirit Airlines Inc. (SAVE), and Twitter Inc. (TWTR). The top 10 stocks in the Fund at the end of the quarter represented 50.18% of the Fund's holdings. For the fourth quarter of 2017, the Hodges Small-Mid Cap Fund experienced a return of 9.51% compared to a gain of 5.24% for the Russell 2500 Index. For the full year, the Fund experienced a return of 9.17% compared to a gain of 16.81% for the Russell 2500 Index. The Fund’s favorable relative performance in the final quarter of the year was attributed to a handful of energy and industrial stocks, such as WPX Energy (WPX) and Eagle materials (EXP). Top ten holdings at the end of the year represented 43.78% of the Fund's holdings and included WPX Energy (WPX), Norwegian Cruise Line (NCLH), Conn’s Inc. (CONN), Select Energy Services Inc. (WTTR), Pilgrim’s Pride Corporation (PPC), Nutanix Inc. (NTNX), Eagle Materials Inc. (EXP), QEP Resources Inc. (QEP), Alaska Air Group Inc. (ALK), and Affiliated Managers Group (AMG). Total assets in the Hodges Small-Mid Cap Fund at December 31, 2017, stood at $16.7MM compared to $19.7MM at the beginning of the year. The year-to-date decline in assets primarily reflected net outflows of $3.6MM during the calendar year. However, the Fund did see modest inflows in the final quarter of the year of $0.2MM. Looking ahead, we hope to see this strategy attract further interest from both institutional and retail investors seeking active portfolio management among small and mid-cap stocks. The Hodges Small Intrinsic Value Fund experienced a gain of 3.26% in the December quarter of 2017 compared to a gain of 2.05% for its benchmark, the Russell 2000 Value Index. 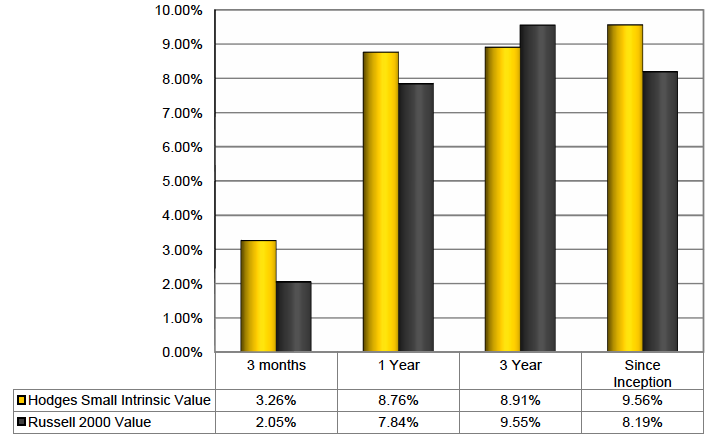 The full year return amounted to 8.76% compared to a 7.84% return of the Russell 2000 Value. The Fund’s positive relative performance in 2017 was largely attributed to the Fund’s technology and industrial exposure, which also reflected a positive stock selection effect from names such Tower Semiconductor (TSEM) and LGI Homes (LGIH). The top ten holdings at year end represented 33.86% of the Fund's holdings and included Triumph Bancorp (TBK), Veritex Holding (VBTX), Eagle Materials Inc. (EXP), Commercial Metals Company (CMC), EZCORP Inc. (EZPW), Select Energy Services Inc. (WTTR), Century Communities Inc. (CCS), Farmer Bros. Co. (FARM), KapStone Paper and Packaging (KS), and Tower Semiconductor (TSEM). Total assets in the Hodges Small Intrinsic Value Fund at the end of 2017 stood at $89.6MM compared to $111.3MM at the beginning of the year. The Fund experienced net outflows of $24.7MM during the recent quarter, which reflected a large investment advisor reallocating their client portfolios away from small cap domestic stocks. Although small cap value investing has recently been out of favor, we believe the fund’s core investment approach to investing in small cap stocks that trade at or below what we view as the intrinsic value of the underlying business is still marketable to both institutional and retail investors. To sum up, we remain dedicated to our core investment philosophy of investing like owners in individual business and are encouraged with the long-term investment opportunities surrounding the Hodges Mutual Funds. By offering six distinct mutual fund strategies that cover most major segments of the domestic equity market, we have the opportunity to serve the diverse needs of most financial advisors and individual investors. While our opinions regarding stock prices are subject to change with the prevailing market conditions, our commitment to the shareholders of Hodges Funds is not. Feel free to contact us directly if we can address any specific questions.